This week’s is especially appropriate as Braden has once again been sporting his customary bandage. Last week, when working on a truck that was lifted up on a hoist, he walked right into the trailer hitch and received a nice-sized gash for his troubles! 1. Go to your documents (I changed this to “my pictures” in my documents file). 5. Tag 6 friends to do the same. This is, of course, my youngest son Braden for those of you who don’t know us. For future reference, if you see a picture of my children and are wondering who is who, Braden is always the one with a bandaid, cast, stitches, etc. on some body part. The bandaid featured prominently on his forehead here is probably the 27,316th that has been in that exact same spot. When he was little, Braden bypassed walking and went straight to running. The only problem with that is that he spent all of his time looking down at his feet and not enough time looking ahead. Needless to say, he spent most of his first few years with a giant goose-egg on his head from running headlong into furniture, parked cars in the driveway, etc. etc. I seriously worried that he would grow up and look like one of the Coneheads of SNL fame due to the calcium build-up. Luckily that hasn’t happened (at least not yet!). When he turned 5 he learned to ride a two-wheeled bike, just like any normal kid. Within two weeks, he had also mastered the art of standing on the seat, balanced on one leg, hands in the air, with a grin from ear to ear. I quickly learned that when I heard the words: “Hey mom! Watch this!” that it was more than likely something I really was better off NOT seeing. And then I wonder where all my grey hair has come from! The picture in question was taken on the first day of summer camp 3+ years ago. That summer, Josh had volunteered to be a camp counselor during some downtime he had before going active duty, knowing that both Evan and Braden would be at camp and that he’d be able to have some quality time with them. Our home had been a beehive of activity for days, getting all the sleeping bags, flashlights, bug spray, etc. etc. that was needed. The boys were in high spirits as they headed out on their grand adventure around 8:00 a.m. that morning. By 1:00 p.m. that same day, the home phone rang with the camp nurse asking for “Braden’s mom.” Never a good feeling… After making it safely to camp (which had been my main worry given that they were riding with Josh! ), the campers had stowed their things in the cabins and then gone swimming in the swimming pool. Braden, true to form, had to show his prowess on the diving board. And he couldn’t just jump off the diving board into the water, OH NO, he had to perform some sort of convoluted back-flip with half a spin, yada yada yada. 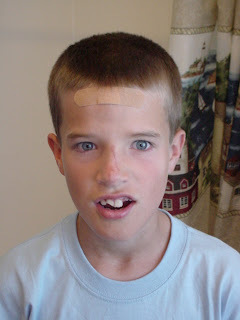 Well, as the picture shows, THAT plan didn’t turn out so well… His head didn’t clear the diving board, and as he spun around, he managed to break his front tooth in half (exposing the nerve), skin most of his face, and get the obligatory goose-egg on the forehead. That day was probably one of the longest of Braden’s life (he has several others I’ll have to blog about another day) as the exposed nerve made it extremely painful to talk or, as he said, even breathe. And if there’s anything Bray loves to do, it’s TALK, and talk and talk and talk and… There are days that Tom and I often look back longingly at that quiet day… 🙂 Tom drove to pick him up while I stayed home calling dentists’ offices on a Saturday. I finally was able to get hold of my own dentist and made an appointment for 9:00 p.m. that evening. The missing portion of the tooth was never found, so he rebuilt the tooth (at great cost, of course!) and now you’d never even know it’s not his own. Anyway, who else wants to play tag?